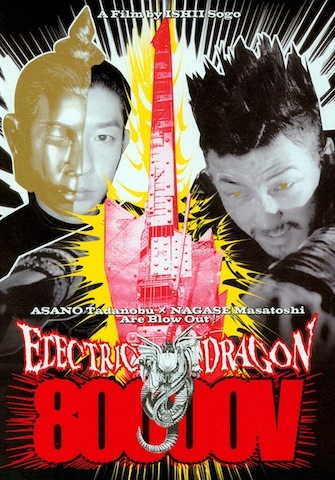 Beginning with a small boy climbing an electrical pylon, Ishii Sogo's Electric Dragon 80000v gives the viewer a 54 minute jolt as strong as the one the boy receives when he's electrocuted and falls from the pylon. When he comes round he's changed, he has the ability to not only absorb electricity but to communicate with lizards! He's also given to fits of violent rage where he discharges electricity through his fists. These violent urges can only be controlled by one thing, playing electric guitar loudly and badly. Not a narratively strong movie by any stretch of the imagination, the film comes down to a confrontation between the boy grown up into "Dragon eye" Morrison (Tadanobu Asano) and Thunderbolt Buddha (Masatoshi Nagase), a criminal/vigilante who creates his own electric weapons, wears half a bronze head mask and sits in a (Low budget) Bond villain style lair. Sogo gives the characters little development but the film gets by on sheer insanity and style. 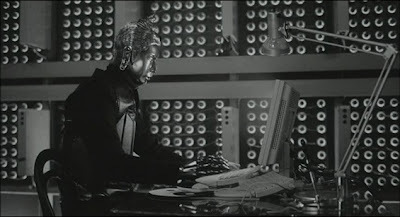 The film has a lo-fi cyberpunk feel shot through with a David Lynch aesthetic. Gorgeous crisp black and white photography captures superb Japanese locations, and a real industrial vibe created by endless shots of electrical cabling and instruments. 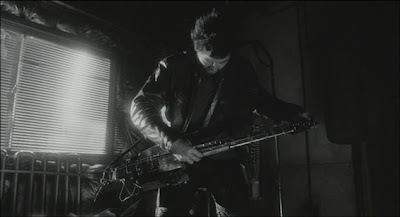 The Lynch feel is even more prevalent in the incredible soundscape of the film, using music, guitar noise and an amazing array of hums, buzzes and cracks of electricity. The amazing sound design is all brought to life via a raucous DTS 5.1 surround track on the dvd. 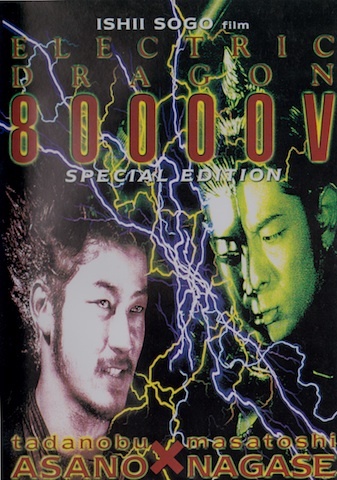 Electric Dragon 80000v has a distinctly experimental feel, but is still relatively accessible, it's actually very simple and it's debatable as to if any of it actually means anything but I had a great time with it. Asano is as cool as ever (although he's probably the least convincing guitar player in film history!) and while the narrative is slight to say the least, it's a superb audio visual experience, just be sure to crank up the volume. Fabulous review Mart, I must get this ! Thanks Wes, I'll be interested to hear your thoughts on it. I'm going to be watching it again soon! Looks a bit like Tetsuo! Rich, Yes and no, this is much more polished than Tetsuo, and has a different kind of energy but I found it no less exciting. I've never heard of this one. Sounds awesome insane! Gotta check it out. Great review man! Thanks rG, it's all those things and at 54 minutes it won't matter too much if you don't like it! Just remember to watch it LOUD.